My beautiful girl died peacefully at home in my arms late yesterday afternoon, with the loving and gentle assistance of my dear friend and Amber’s vet, Fern. As some of you already know, she had been sick for ten days and at the Hope Center for Advance Veterinary Medicine in intensive care for the last three and a half days. We just received confirmation today that what we had suspected was true – a calici virus had ravaged her system, causing multiple problems ranging from laryngitis to pancreatitis, complicated by an underlying heart problem we didn’t even know she had, which made it impossible to find the right balance between providing supportive care and not pushing her heart too far. Yesterday it looked like she was getting better, but yesterday morning, she took a turn for the worse, and her prognosis was so poor that I decided against further treatment. I took her home and spent the afternoon with her. The final good-bye was very peaceful. Amber was a wise old soul in a feline body. Her gentle, loving presence brought so much happiness and joy to my life these past ten years. 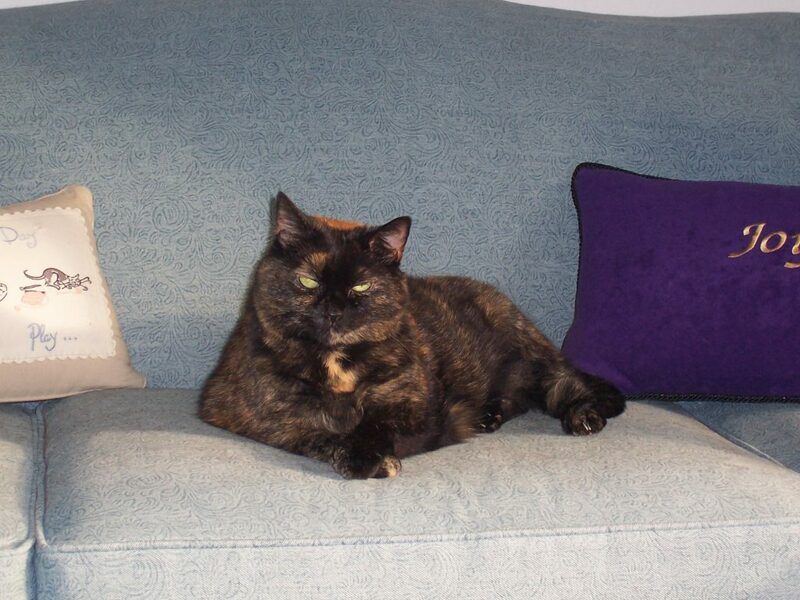 She was the inspiration behind The Conscious Cat, and even had her own column here, titled Amber’s Mewsings. You can read her entire story here. I’m still in shock – I keep hoping I’ll wake up and find that these last ten days were just a bad dream. I’m going to miss my beautiful girl terribly. Her little sister Allegra only got to know her for a little over a month, and it breaks my heart that the two of them never got a chance to become close. Amber taught me to slow down, to appreciate the gentleness in each moment, and to listen with and to my heart. Every cat we loose takes another little piece of our hearts. Amber took a big piece of mine tonight. Thanks for your sweet words, AttieCattie. just heard about you, sweet amber. goodbye, be at peace on the rainbow bridge. your mommeh and all your friends here miss you so much. we got so weepy reading all the tributes to you. it sounds like you were a verreh special girl indeed, and we are sure you will continue to shine wherever you are now. A piece of your heart definitely went with Amber. I know she is missing her mama. But take a look – she’s on her favorite cloud right now, purring, eyes half closed, with her paws close to her chest and she’s holding something in her paws, very close to HER heart– it’s that little piece of YOUR heart. Your Amber could not possibly have had a more loving mother. She knew to the very end and beyond how deeply she was loved and cared for… sparing her that additional treatment that wouldn’t have made the difference contributed to your and her peaceful goodbye, which was first and foremost because of her love and trust with you and your comforting presence in her final hours. It’s such a devastating loss for you, even so, so please trust and know that she is watching over you with the same love that she showed you here on earth. I am just so sorry, Ingrid. I know too well how you are feeling; yet, my knowing doesn’t begin to compensate for all you are feeling. I, too, thank God that you have Allegra still with you; yet, I know that one cat does not replace another in any way, shape, or form. The most you can hope for during this time are some times of unexpected comfort from Allegra still needing you and her willingness to be there for you with her soft body and warmth and love. With my Pooh having the non-virulent form of calicivirus, I’ll always remember my phone consultation with you when she had not been drinking/eating on her own and I was having to hand feed her and give sub-cu fluids. It had been going on for over a month. In the middle of our phone consultation, she spontaneously stood up, got off me [from where she’d been lying on my chest, with me lying down] and walked straight to her water and began drinking on her own. She resumed eating normally, as well. During that time, you also offered that Amber’s intuition and receptivity were both so strong that, if I ever wanted, we could do a consult using her, as she has been part of your process, as well. What both you and Amber have brought to this world has been so important to so many of us. You gave Amber the best possible life she could ever have had and I hope you can find some comfort and rest in knowing that. Dear Ingrid ~ I am stunned to read that Amber is now so suddenly gone. I am so deeply sorry to hear such devastating news for you. I know you have the very best veterinary care and practices [alternative and otherwise] available to you, not the least of which is yourself with all you do and especially your love for her. It’s inconceivable to me that she’s no longer with you, and I feel the gaping hole her absence leaves in your life. Tears are filling my eyes as I write this, Ingrid. One of the vets I take Pooh to had told me how he’s read ~ and I have read some, too ~ about a very virulent form of calicivirus, where cats are all but powerless against it, and it takes them very quickly. It sounds like this is clearly what happened with your dear Amber. How devastating for her to go so quickly. Merciful in a way for her, yet no time for you to adjust to her impending loss at all. I know you had to be filled with hope until the very end, as this was just so inconceivable. My heart is with you, Ingrid, and with your dear Amber as she rests now elsewhere. Thank God you were with Amber when she left. She left under the best possible conditions, in her devoted and loving mother’s arms. Thank you more than words can say for all your love and support to all of you – your beautiful words are providing comfort during these dark days. Oh Ingrid, I am so sad to hear about Amber. Mosby and I send our love and prayers all the way from Texas. I asked Xena to show Amber around heaven. We were so fortunate to have them for just a little while. God Bless. I am so sorry for your loss. She was a beautiful cat, loving, caring, and kind, and she always knew how very much you loved her. I am so sorry for your loss, Ingrid. My heart goes out to you. I’m so sorry to hear that Amber passed. She will be missed by many! We is so sorry to heer that Amber hadta go to tha Bridge. Purrrrrrrrrrrrrrrs for yore sads.